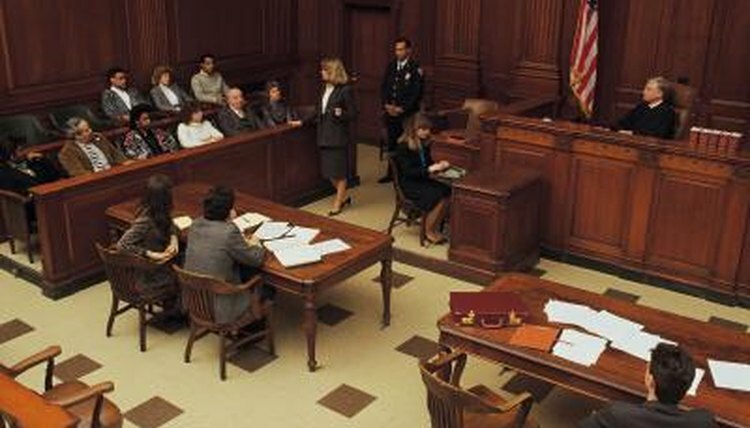 A criminal trial goes through several stages and procedures before the defendant receives a final decision. The initial appearance and arraignment occur shortly after the plaintiff files a formal criminal complaint. With both procedures, a judge requires the defendant to appear in person and hear the official charges. Significant differences between an initial appearance and arraignment focus on what actions and information the court system requires the defendant to declare. Even though the judge reads the official charges against the defendant at the initial appearance and arraignment, the defendant does not respond to the charges at the initial appearance. At an arraignment, the defendant must enter in a plea of "guilty," "not guilty," or "no contest." The court system considers the arraignment to be a formal notification of the charges, while the initial appearance is an advisement. Judges must notify defendants of their legal rights when they read the charges at an initial appearance. What Happens at a Felony Arraignment? What Does it Mean to Be Indicted? At an initial appearance, the judge is responsible for verifying the accuracy of the defendant's identity. During the appearance, the defendant must confirm he is the person listed in the formal complaint. The arraignment does not require the judge to confirm the defendant's identity. In some cases, the court schedules the arraignment immediately following the initial appearance. The defendant may need to verify that he understands the charges or complaint filed against him at an initial appearance. Most judges will ask the defendant if he has a copy of the original complaint. If the defendant enters a plea of "not guilty" at the arraignment, the court system must schedule a trial or a pretrial, depending upon the type of charge. When defendants plead "guilty" at an arraignment, the judge must deliver a sentence. The initial hearing procedure does not allow a judge to declare an official judgment. He will usually advise the defendant of his legal rights and determine whether a public defender will need to be assigned to the case. In some cases, a defendant's attorney may not be present at the initial hearing. This is due to the fact that the defendant may still be in the process of selecting suitable representation. During the initial appearance, the judge typically asks the defendant if he will need public representation, has secured a private attorney or will be representing his own case. At an arraignment, the defendant's attorney is typically present to help him enter in his official plea. Akers, Helen. "The Differences Between an Initial Appearance and an Arraignment." , https://legalbeagle.com/12196332-differences-between-initial-appearance-arraignment.html. Accessed 21 April 2019. What Happens at a Motion for Entry of Judgment? What Is a Status Hearing in a Criminal Case? What Happens During an Evidentiary Hearing?